As of April 27th, 2017 this plugin is no longer for sale. Simply Hired has ended their partner solutions program so this plugin no longer works. 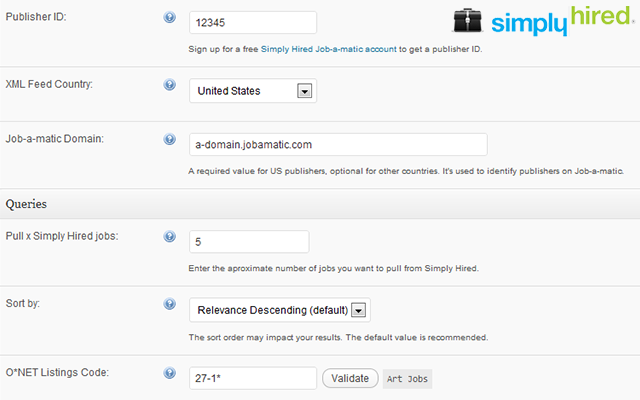 A highly customizable aggregator that publishes job listings on your site using the Simply Hired API. Requires JobRoller (our WordPress job board theme) and a Job-a-matic account from Simply Hired. So far, been a few days, I have not heard from SimplyHired to activate and get it going. I did hear from CareerJet and it is running great! @carlos6627, can you please post your issue on Simply Hired’s support forum so the support team can help you? @carlos6627, just to follow up on this, a new version of the SimplyHired publisher plugin was made available on the 6th of March 2014. If you have already updated this and are still experiencing issues, please do post in the forums and our team can assist. Thanks. You can load any type of job. The branding cannot be hidden as it would break Simply Hired policies to use their jobs feed API. Thank you for answering my questions. A follow up question though. What do you mean by 100 Jobs? Did you mean that when our jobs board lists the number of available jobs, it will only be 100? Could you please clarify? It means you can list 100 jobs at a time. Visitors can click ‘Next Page’ to load 100 more jobs, if available. 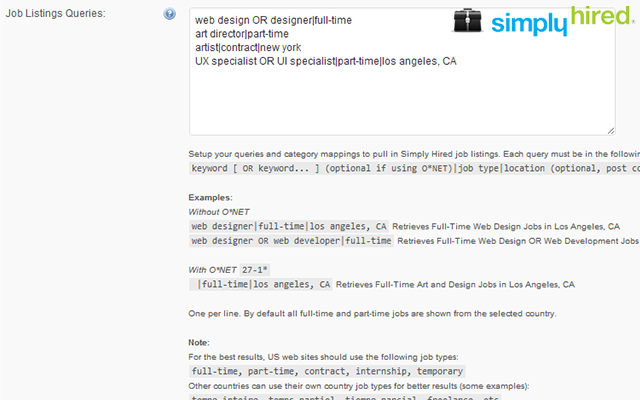 The Simply Hired API only allows fetching 100 jobs per request. Also, do I need to do anything for the recent simply hired jobamatic changes as per link below or will this happen automatically? If you don’t seen an updated version on your WP dashboard you can download the latest version from your AppThemes dashboard and replace your current files with the new version. You don’t need to do anything else. The latest update covers the recent changes requested by Simply Hired, for their partners. Hi Ben. Each XML feeder retrieves their own jobs and work independently. Although possible, chances of duplicate jobs appearing in the same page are very very low. Looking for duplicates on each provider would heavily slow down job retrieval and it is not worth the performance hit. Well thats good! I was thinking that since the feeds create posts (correct?) that the duplication issue would be handled within your WP install. The reason I ask is because do see duplicates on these job outlet sites so there definitely would be duplicates at some points. Maybe I would have to check manually? Or maybe there are so few duplicates it doesn’t really matter… Thanks for the reply. Ben, the XML feeds do not create posts. Although you can list and paginate jobs coming from external providers, they do not generate any posts. When a user clicks one of these links he will be redirected to an external link. What version is simply hired and careerjet plugin? Are they up to date? Yes @Pat, they are up to date. Does this feed in jobs from every country and does it match the style of jobs to your site as indeed does not which is very annoying ? @james, the jobs are displayed like normal jobs with the additional indication that they are external jobs from Simply Hired. Quick question. When using SimplyHired Pub, will my users be directed to an external website when they find a job that they would like to apply to, or would my users be able to apply for the SimplyHired jobs on my website? Just want to know if it’s like the Indeed feed which takes users to an external site completely. 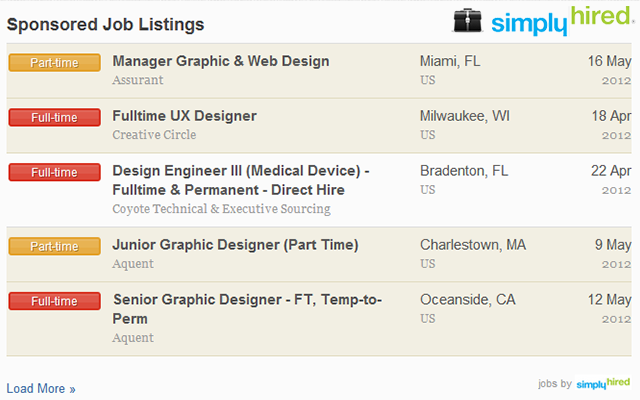 @starahj, the SimplyHired plugin works the same way as the Indeed feed. When applying to these jobs, job seekers are redirected to an external site. Is it possible to redirect them to a page (or a message) before brining them to the site? @joe, users are redirected to the link provided by the SimplyHired feed. In order to change this behavior you would need to “hack” the code. This is not recommended unless you’re comfortable with PHP. Can I use your plugin and Simply wired to populate my website with jobs form several countries? Will your plugin work with new platform? My plugin stopped working… looks like its not compatable with the latest JobRoller. Is there any fix for this? Since job o matic is discontinued i need to know if this plugin works? Developers can you please let us know as others are saying it doesn’t work anymore. Please Update! 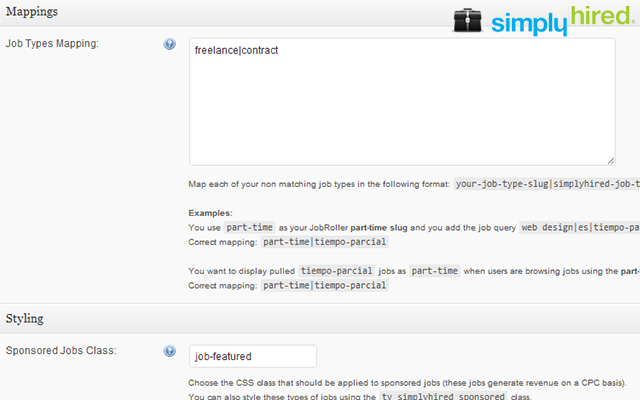 @freshjustin, the plugin was recently updated to work with the new Simply Hired API. This plugin is not working with Simply Hired at the moment. Can you help? No response on support forum. Hi. I am trying to get this working for a client but it is not working with Simply Hired. We have version 1 installed. How can we get the latest version? Roger, what versions of JobRoller and SimplyHired are you using? I was able to update the Plugin this morning. Do we need to update the theme? @mandour, if you are not using custom features or a child theme that is stuck on a specific JobRoller version we always recommend customers to update their themes to the latest version. In your case, that’s specially true since you’re using a very old JobRoller version (current version is 1.8.1). If you are not able to upgrade to JobRoller 1.8.1 and you’re using a child theme please try temporarily disabling it (switch to a default theme) to see if the issue persists. For additional support, please use the related support forum (http://forums.appthemes.com/simply-hired-publisher/).